If you or someone in your family is a vegetarian, you may be looking for some creative recipe ideas for meatless main dishes that still capture the elegance and tastiness of the fall season. I have found two different recipes that I know are delicious and worthy of a vegetarian Thanksgiving feast. Recently, North Texas Kids has received several stellar cookbooks with some great recipes to review. One of those cookbooks is perfect for the Thanksgiving potluck dinner that most of us participate in. It’s called Fix-It and Enjoy-It: Potluck Heaven by Phyllis Pellman Good. Click here to read more about this book. This is not a vegetarian cookbook but it has some great meat-free entree ideas. The book is full of “543 Stove-Top and Oven dishes that Everyone Loves” submitted by cooks just like you and me! I found some familiar favorites but also some unique ideas for potluck dishes. I also appreciated her tips for “Carrying In” foods for potlucks as well as “Hosting” a potluck. Great information! For a Thanksgiving main dish sure to please any vegetarian, I picked Pesto Lasagna Rolls, which is a recipe submitted by Joy Uhler from Richardson, TX. I love the bold flavor of pesto, plus I love easy to prepare and serve dishes. The prep time for this is only 25 minutes, way less than a traditional turkey dinner. This could be served with some beautiful French bread and a fall salad of greens, pears, feta cheese with a balsamic vinaigrette. Spread 2 cups pasta sauce in bottom of greased 9×13 pan. Combine garlic, ricotta, spinach, pesto, egg, Parmesan, salt and pepper in bowl. Place cooked noodle on clean kitchen towel or cutting board. Spread ¼ c. ricotta mixture on noodle. Roll noodle up. Place seam-side down in baking pan. Repeat with remaining noodles. Place 4 in a row the length of the pan. Make 3 such rows. Pour remaining pasta sauce over noodles. Cover pan with foil. Bake 20 minutes at 350 degrees. Uncover. Bake until cheese is a golden brown, about 10-15 minutes longer. *I love to cook, so I would most likely make the tomato sauce and pesto from scratch. Both are easy to make! I do love the option of the pre-prepared sauces, as it makes this dish quick and easy to compile! The second dish is a fall favorite that I love to prepare and has so much versatility! I borrowed this particular recipe from a great article titled “10 Vegetarian Thanksgiving Dishes.” Check it out for more yummy vegetarian entrees. 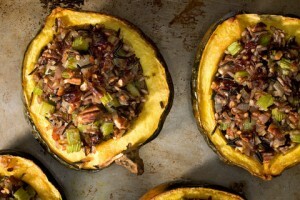 Check the original recipe here, there are some good tips for cutting acorn squash! Place squash cut side up on a baking sheet, brush 1 tablespoon of the melted butter over the tops and insides of the squash halves, sprinkle with brown sugar, and season with salt and freshly ground black pepper. Roast in the oven until just fork tender, about 25 to 30 minutes. Meanwhile, place 1 tablespoon of the melted butter in a large frying pan over medium heat. When it foams, add the onion, shallots, and celery, season with salt and freshly ground black pepper, and stir to coat. Cook, stirring occasionally, until just softened, about 6 minutes. Stir in the thyme and cook until just fragrant, about 1 minute. Remove from heat and stir in the rice, pecans, cranberries, and measured salt and pepper. Suggestion: To add some additional protein to this recipe, this type of dish works great with lentils or chick peas.